This experiment will test a subject’s response level while being exposed to a series of pictures with one of the pictures being drastically different and repeated five times over the course of the presentation. The subject should experience habituation, and his/her electrodermal response and heart rate should continually decrease after each exposure to the aberrant image. 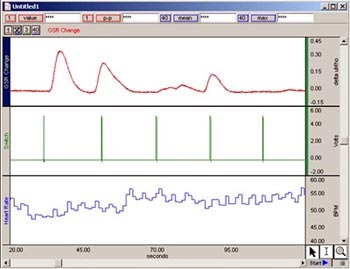 Monitor electrodermal response and heart rate during repeated presentation of a stimulus to demonstrate reduced response. Illustrate that habituation is a probabilistic trend toward decreased responding.